This paper develops a ‘structural political economy’ approach to two fundamental tensions that emerged as the eurozone crisis unfolded: real exchange rate misalignments and external debt build-up. The approach builds on a classical legacy going back to Francois Quesnay, who conceptualised interdependent sectors as being also socio-political groups. In the context of the European integration process, we analyse the overlapping economic and political dimensions of how sectoral interests evolved within and across countries with regard to real exchange rate adjustments and potential debt write-offs. Central to our analysis is the interplay between sectors’ particular interests and their interest in preserving the ‘viability’ of the systems to which they belong (regional, national, supranational). The sectoral perspective developed in this paper complements, enriches and often questions results usually obtained from country-level political economy analyses. 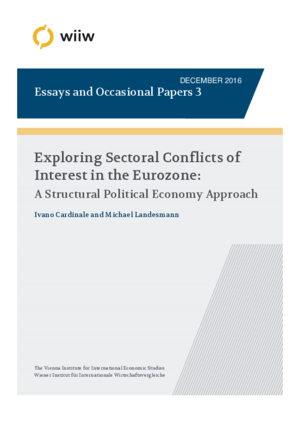 In the last section of the paper we show how sectoral and country-level interests are at play within the institutional set-up of a monetary union, and how this can lead to stances in favour of further integration or disintegration.